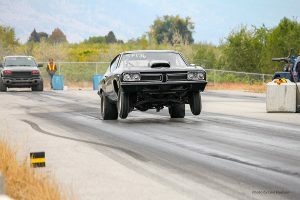 Photo by Levi Hodson, Oliver, BC: Brad Baxendale launches his 1969 Pontiac Beaumont hard from the starting lights at Richter Pass Motorplex in Osoyoos, BC last weekend to drag home the Super Pro trophy. The driver known only as “Fish” (1978 Dodge pick-up) has a whopper of a tale to tell his friends back in Enderby. Fish hooked himself a big one in the final round last weekend at R.P.M. by reeling in Mitch Theodor and his 1968 Plymouth Baracuda (Coldstream, BC). Yet another trophy travels home to Enderby, BC with Jason Lutz (1966 Ford Fairlane). Lutz beat out Jim Piggot (1971 Plymouth Duster) from Salmon Arm, BC. Jim celebrated his 40th birthday Sunday by making it to the final round. Hometown guy Brad Baxendale (1969 Pontiac Beaumont) is the only person to keep a trophy at home this weekend by beating Summerland, BC’s Phil Walter (1986 Nissan pick-up). Terry Soluk (2007 Kawasaki Ninja) zipped by David Layton (1999 Yamaha snowmobile). These two gentlemen represented Okanagan Falls, BC well in the final round last weekend. Ryan Furlong (1968 Dodge Dart) took the reaction time trophy to Enderby, BC with a nearly perfect .501 light. Cliff Meeds received the Ron Tasker Memorial trophy this season. Meeds not only shows up on race days to compete in his 1949 Mercury pick-up, but is also one of the volunteers and board members of WCRA. Hours of work and preparation go into creating each event, and Cliff is always ready to lend a hand, with a smile and a great attitude. If you get him talking, you can usually get a few funny stories out of Meeds about growing up in Oliver and (you guessed it) his many vehicles. Many thanks to all the sponsors, volunteers, and FANS that make each and every race day possible. Remember, check out www.winecountryracing.ca over the winter. Cutline: Two next-generation Cachola drag racers face off at the starting lights last weekend at Richter Pass Motorplex. Dustin Cachola (Trans Am) at 14 years old and Susannah Cachola (Yukon) 17 years old are perfect examples of why WCRA exists. A safe, legal venue to compete has given both of these youngsters motivation to bring up their academic performance. Last Sunday, September 23 was the 9th time around for the Wine Country Racing Association (WCRA) to play host with their annual Car Club Challenge. 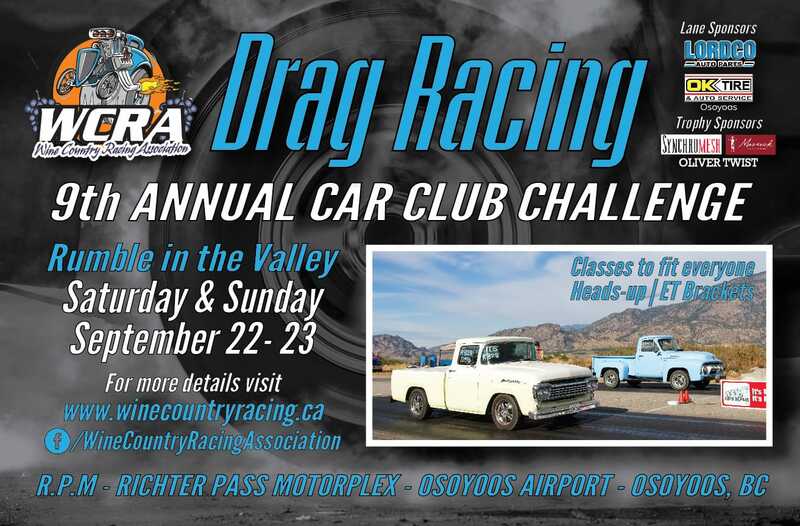 This Okanagan Valley-wide rumble drags the racers and fans in for a day packed full of drag racing in British Columbia’s pocket desert. This year a newly entered gang of gear heads, called the Detonators, rumbled and roared their way to the trophy presentation. Mason McCune (1989 Ford Mustang) was the Detonator’s champion, and proudly hauled the trophy back to Enderby. It was no easy task. Rick Hill didn’t come from Summerland, BC in his 1958 Ford pick-up to mess around. He took the Okanagan Rodtiques right up to the final round. McCune may have looked fresh-faced to the fans, and it was for good reason. This young man isn’t yet 21 years old, and is a new-comer to the sport. This marked his second drag racing day. McCune is yet to lose a race. I can only imagine the fierce competition that the 10th Challenge holds in store. McCune races with his Dad, James, and his uncle, Jason, who are also part of the Detonators Car Club. Drag racing is definitely a family affair down at Richter Pass Motorplex. A 2nd trophy is awarded to the Club winner in the “Fast 8” competition. The name pretty much tells you how this competition works. Fastest 8 cars, battling it out to find the one speedy champion. This year the Rodtiques’ own Tom Groot (Summerland, BC) flew past the competition in his 1967 Firebird. No doubt Kelowna Kustom’s Rand LePage will be back next year with his 1956 GMC pick-up, determined and ready to upset the story. Don’t be mistaken into thinking that the Car Club Challenge was the only thing shaking up the track last weekend. A group of racers from Kelowna, known as the Kelowna Outlaws, made an appearance. This club rolls up in their cars…no trailers here. These super fast street legal vehicles are required to make passes at drag tracks throughout the province and had a minimum number of passes they had to make. Their vehicles then had to get them all the way back to the BBQ in Kelowna, in order for them to get credit in their club’s standings and remain in the competition. It’s not too much to say that these were some impressive rides. Let us not forget all the “regular ol’” drag racing that went down. WCRA can now boast that this last weekend was a record breaker in car count. 123 registered drivers signed their names and pushed their cars to the limit, all in the name of a good time. Stuart Eckley (Osoyoos, BC), riding his 2002 Kawasaki 2X9 beat out Sonny Plamondon (Grand Forks, BC) and his 1986 Suzuki GS550. Jim Behnke (Mission, BC) brought his 1973 Plymouth Scamp a long way to beat out hometown guy Blake Ogilvy (Osoyoos, BC). Ogilvy raced the track in his 1981 Chevy pick-up this weekend. Chris Kroening (West Kelowna, BC) took his 1969 Chevy Beaumont to trophy lane by beating Robin Redding (Merrit, BC) and his 1927 model T.
Kayle Shaw (Penticton, BC) was ripping it up in the Boult Automotive propane powered, 1973 Vega. 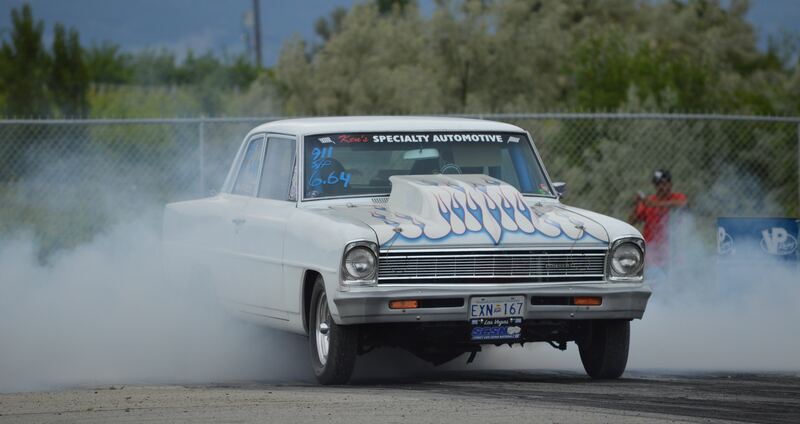 Shaw outdid Brad Baxendale (Osoyoos, BC) and his 1969 Chevy Beaumont. .502 starting light. Remember… .500 is perfection. WCRA has one event left this season. 2018 winds up on Thanksgiving weekend, October 7. Nothing pairs with turkey quite like drag racing. Gates will open in two weeks at 9 a.m. $10 gate fee applies to all over 12 (kids must be accompanied by an adult.). Concessions are available on site. Car Club Challenge coming soon! One may think they’re seeing double as these two beautiful Chevy Camaros approach the startling lights at the Osoyoos,BC airport. Wine Country Racing Assn plays hosts to racers and fans from both sides of the border at their drag racing events. 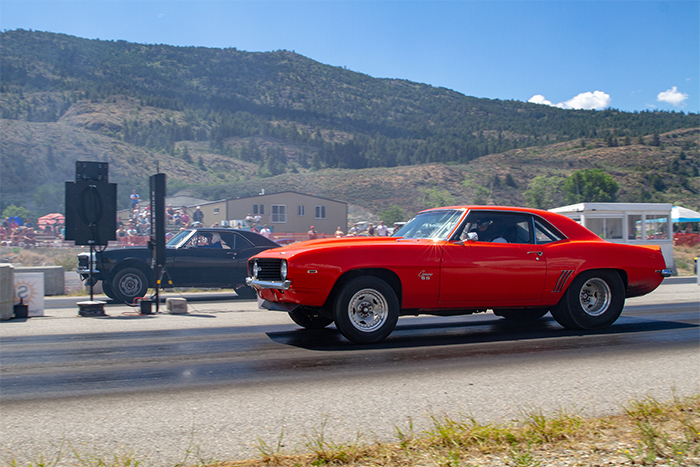 As the summer heat pours over the Okanagan Valley, it’s time to put the drag cars to rest until fall. 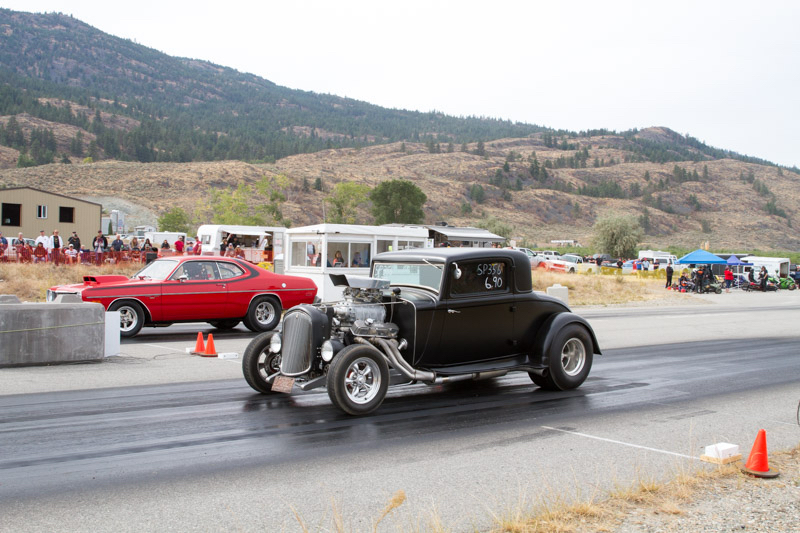 Father’s Day at Richter Pass Motorplex in Osoyoos,BC was a hit for more than just dads. Wine Country Racing Association hosted the third of their 5 events scheduled for 2018. The results for the day follow. Osoyoos, BC had the showdown locked in on Sunday for Sportsmans’ Bracket. Brad Baxendale triumphed in his 1984 Chevy Camaro over Glenn Taylor in his 1990 Ford Mustang. Shane Williamson raced the Pro trophy home to Enderby, BC in his 1967 Camaro; beating out Oliver, BC’s Cliff Meeds in his 1949 Ford truck. Jim Wanner brought his 1969 Valient a long way from Prince George, BC, driving it to victory over Grand Forks, BC’s Levi Wierberg (1981 Buick Regal). Lorne Stavinga went back home to Grand Forks, BC a happy gentleman. Stavinga zipped the trophy out of the competition’s grasp on his 2001 Suzuki 1300. Rob Skilling, from Grand Forks, BC had a perfect .500 reaction time in his 1970 Chevelle. Enderby’s Jordan Almaas lines his 1969 Dodge Dart up against Robin Reding and his 1927 Model T for the Pro Bracket final at last weekend’s drag race. Successful opening day at R.P.M. 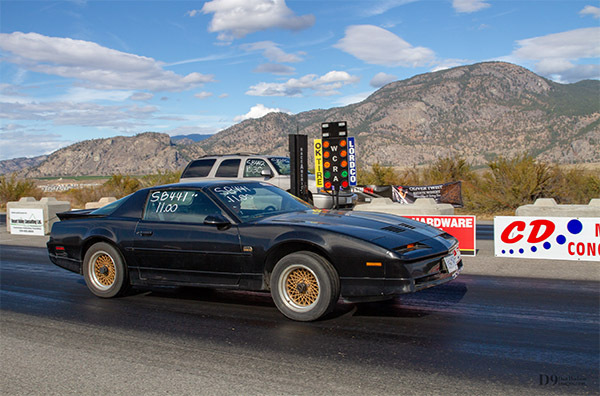 Despite threatening skies, the Wine Country Racing Association (WCRA) pulled off a successful start to the 2018 drag racing season at Osoyoos, BC’s Richter Pass Motorplex. Glenn Taylor (Osoyoos, BC) was able to climb his way to the top of a mountain of street cars Sunday. Consistency in his 1990 Ford Mustang pays off. Robin Reding (Merrit, BC) drove his 1927 Model T to victory in the Pro Bracket. Mike “Bucky” Stewart (Langley, BC) took his 1967 Chevy 2 to the victory lane in the Super Pro division. Lorne Stavinga (Grand Forks, BC) zipped past the competition to take home the Bike/Sled trophy. Go to www.winecountryracing.ca for more information, or find us on Facebook to stay updated. 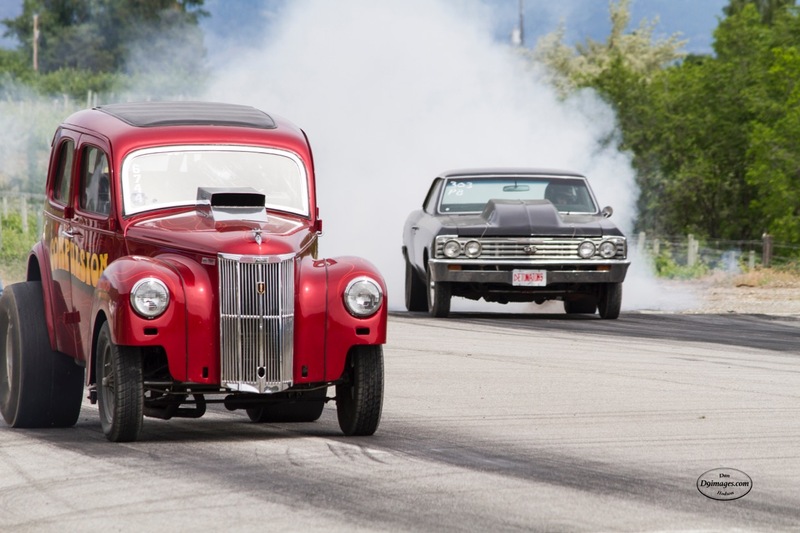 Two June races are scheduled to finish up the spring segment of drags in the South Okanagan Valley. Summer 2017 has turned our Sunny Okanagan Valley into a smoke-filled, socked-in chamber. Only occasionally Mr. Golden Sun managed to burn through the cover and light up our days the way we know he can. 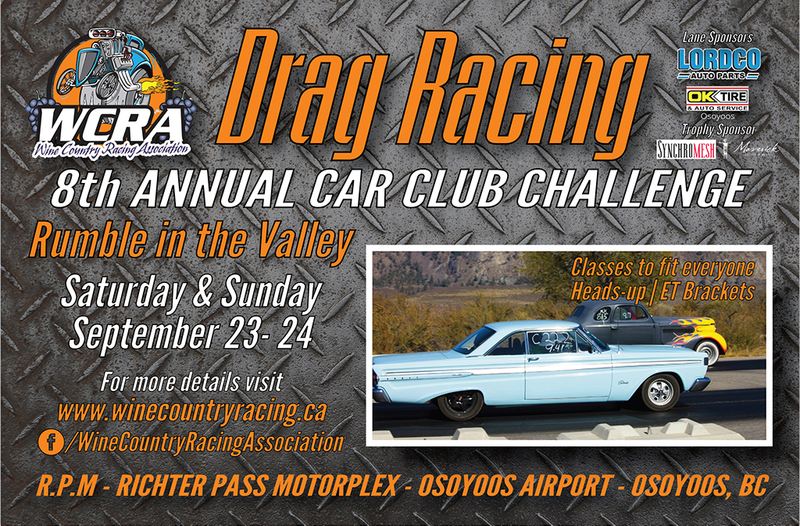 Sunday, September 24 the Wine Country Racing Association (WCRA) offers you a smoke-filled day of a different type. 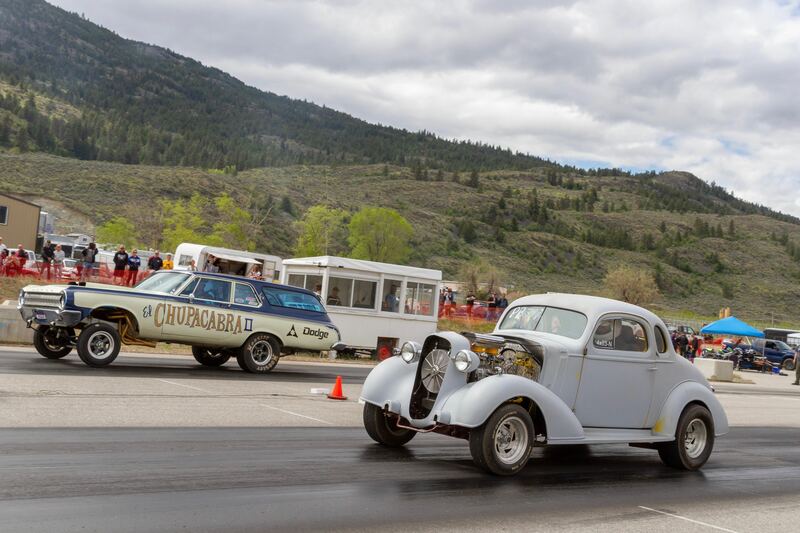 The “Rumble In The Valley” car club challenge returns to Richter Pass Motorplex for its eighth year. Four car clubs from up and down British Columbia’s interior gather their best looking and gnarliest rides in an event that the fans always enjoy. Nothing says vintage racing like wicked burnouts. The thrill-filled day of side-by-side 1/8 mile drag racing will give you and your family tons to look at. Rail type dragsters, rat rods, tire-smoking pickup trucks, noisy diesels, high revving turbo charged imports, and some good ol’ American muscle make up the broad field of contestants. Every racing fan can find a favourite to cheer for. Get ready to really feel the rumble with special guest Nitro Dave O’Hara, from the Vancouver area. O’Hara will show off his Nitro-fuelled, altered 1948 Fiat Topolino. Gates at the Osoyoos airport open at 9 a.m. on Sunday. Cost is $10, kids 12 and under admitted free, and must be accompanied by an adult. Anyone interested in participating should come early to register and have their vehicle passed through technical inspection. Fans can fill the grandstands, bring along their own lawn chair, or back their pickups trackside for the best finish line action. Concessions are available on-site. Come enjoy the smoke, in WCRA style: hot cars, drag racing and exciting burnouts.